So I was in the market for a new bag a couple of months ago and I’ve had my eye on the Marc by Marc Jacobs Hillier Classic Q Hobo for over a year now. I wanted a bag that had a shoulder strap and was functional while still stylish. The only other shoulder bag I have is my Coach Kristin one that I got two years ago in Mexico. The thing that I love about the Hillier is the fact that it’s a simple bag. The hobo style is big enough to carry all my essentials but simple enough to carry anywhere. Anyways, this brings me to about two months ago when I picked it up at Ogilvy in Montreal. We have this bag in my city but they only carry it at Aritzia, and at the time they only had it in black. When I travel I usually buy one expensive purchase which, on my last few trips it’s always been bags. I don’t typically like spending a whole lot of money in my city because it takes all the fun out of buying it elsewhere (I like to think of these things as souvenirs), plus I always have money set aside to spend on while on my travels and I like buying investment purchases rather than just clothes as they will last longer than something I will get sick of easily. Plus designer bags typically go up in price as the years go on. The Hillier hobo comes in two sizes, the Classic Q (which is the one I got) and a larger size. I chose the Classic Q because i’m short, plus I don’t carry that much stuff so I didn’t need a gigantic bag. I chose the colour brown (espresso) but it comes in a whole variety of shades. I was torn between the bone colour and the brown but in the end I decided to go with the latter because it’s more functional and plus I didn’t want to risk getting colour transfer on the back (this happened slightly on my Coach). The bag is made from pebbled Italian cow leather but don’t be fooled, it’s actually made in Indonesia. Regardless, it’s a smooth, supple leather that goes softer and creamer with time and use. Mine has gold hardware on it although I have seen some colours with the silver. There isn’t a ton of hardware, rings that hold the straps and a plaque on the front. Inside there is a magnetic closure (super strong too) and a zipper pocket, a cell phone pocket and another smaller pocket (for lipsticks, keys, or pens). As for the lining, it’s black and white with the monogram Marc by Marc Jacobs all over. As dark and deep at the bag is, it’s actually surprisingly easy to find things. The handbag has two straps, a shorter one that can be held either by hand, in the crook of your arm, or over your shoulder, as well as a slightly longer one. The longer strap isn’t a full cross body one though; you can wear it across but it’s a tight fit, it sits a little ways down the middle of your torso (it measures at seven inches). 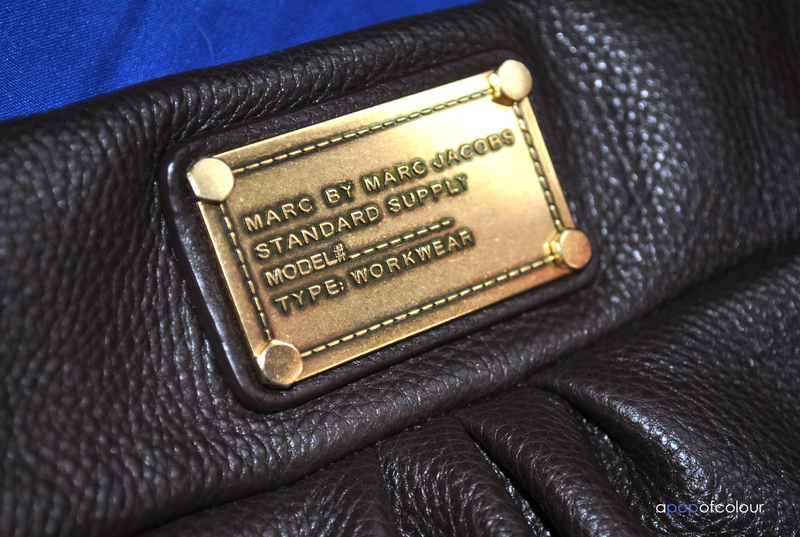 The bag also comes with a white felt dust bag with the Marc by Marc Jacobs logo on the front. So would I recommend this bag? Yes, it’s definitely my go-to bag for the spring and summer and it’s so simple that you can wear it everywhere. It is a bit pricier compared to other MBMJ bags out there, retailing at C$445/ $428 USD (the brown one when I got it was for some reason $5 cheaper), but compared to other designer bags like Louis Vuitton, Chanel, Balenciaga, Gucci, etc., it’s quite reasonable. Personally, I think it’s worth it because if you take good care of it, it will last forever, plus it’s a timeless shape and colour that will never go out of style. Also, like I mentioned before, designer bags typically always go up in price, never down. But with that being said, you can find this bag on sale (although rarely on staple colours) and it’s often, if not always, included in department store friends and family sales (such as the 20 per cent off Saks Friends and Family sale on now until Sunday, April 29. Use code FRIENDS at checkout. Plus, 6% cash back through Ebates when you order online). If you are interested in buying this bag and you are Canadian and don’t want to shop online, Holt Renfrew is having their Spring Bloom promo on April 28 & 29, 2012 where you can get 25 per cent of your purchases (before tax) back in gift cards (redeemable in stores from April 30 to May 31, 2012), so therefore you would get $111.25 to use towards your next purchase at Holts (some exclusions apply). Pretty good deal if you ask me, I can think of a ton of things I would put that hundred or so dollars towards. Do you have the Marc by Marc Jacobs Classic Q Hillier Hobo? If so, what are your thoughts? Also, don’t forget to enter my huge Dove giveaway! * Canadians and Americans only, must be a subscriber!